Stamp set & dies found in the 2016 Holiday catalog, page 9. 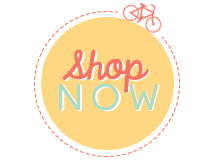 • Miscellaneous: Starlight Thinlits Dies #141840 (or bundle above), Silver Metallic Thread #138402, Rhinestone Basic Jewels #119246, Big Shot Die-Cutting Machine #143263, Magnetic Platform #130658, SNAIL Adhesive #104332, Stampin’ Dimensionals #104430, Multipurpose Liquid Glue #110755 and Scotch Tape. 1. Using 3 of the Starlight Thinlits Dies, the Big Shot and the Magnetic Platform, die cut out of Silver Glimmer Paper. Set aside. 2. 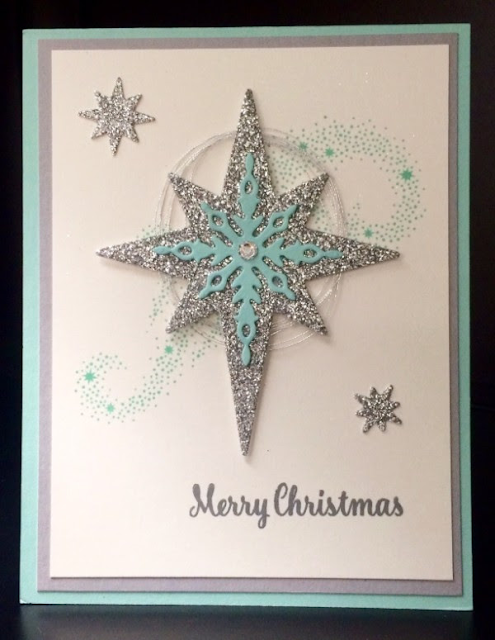 Using Pool Party cardstock, die cut the star that will nest on top of the large glimmer paper star. Adhere together using Multipurpose Liquid Glue and allow to dry. Once dry, affix one rhinestone to center. 3. Stamp starry swirl with Pool Party onto the Whisper White cardstock. 4. Stamp sentiment beneath with Basic Gray. 5. Adhere all layers to one another using SNAIL. 6. Tie ends of Silver Metallic Thread together with a knot. Wind looped thread around fingers to create as many equal circles as you can that will be large enough to lay beneath the star and peek out. Carefully lay the ring of thread onto back of large silver star and adhere with tiny pieces of Scotch Tape or in any other manner that you prefer. 7. Add Dimensionals to back of large silver star then position on top of starry swirl. 8. Using SNAIL or a drop of Multipurpose Liquid Glue, affix the two remaining stars by putting the larger one on top left and the smaller on bottom right.